GMC C/K pickups were first created in 1960. These in-demand trucks had huge V8 engines and were designed for heavy-duty work. As more emphasis was put on engine downgrades, GM took its famous 350 engine and modified it for the CK truck series. 1967 was the first year that the 5.7L 350 engine was used. This is the very same engine minus a couple of upgrades that was used until the mid 1990s. GMC produced this vehicle for 40 years. Get GMC CK pickup 5.7L crate engines at a discount here. Our complete engines are ready for you to drop in a GMC or other project vehicle. Our version of the C/K engine is the L05. This 350 V8 easily gives you 200 horsepower. This engine was originally created for pickups although it can be used with other vehicles. The familiar 350 engine base should be easy for an average engine guy to understand. It’s simple to install one of these classic engines. You don’t have to try to modify something to make it fit correctly. We’ve already done the hardest job of all and that is keeping these crate engines for sale in OEM shape. All parts are 100 percent genuine GM parts that are used. No aftermarket parts exist with these 5.7L crate engines. One of the things that people love about the 350 base engine is the fact that it can be modified. You can settle for the OEM version that you get from our company or you can choose to upgrade it. 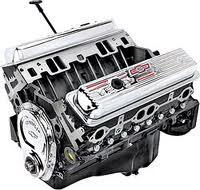 The issuance of the 350 engine as a crate engine by General Motors is a great thing. These engines are in use around the world and ours are no different. We put a lot of effort and time into understanding the GMC engine platform. We are not sellers that just happened to have a website. We too appreciate engines and always want to ensure our customers get a chance to own a great motor. A crate engine swap with one of our GMC engines is not difficult. Whether you have a professional lined up or are doing the drop in yourself, you won’t have issues putting in a 5.7L. Simplicity is something that we like and we work hard making sure engine installations are just as simple for customers. Just about the only thing we haven’t told you is our price. All pricing is accurate and believed to be the lowest on the Internet according to our research. You can own a CK 5.7L engine for a lot less than you might realize. We are a direct seller and offer what we believe to be the highest discounts. We know you’re busy and we don’t waste time. What you want is our 5.7L price and that’s all. We understand what a quote is supposed to be. When you use our online engine quote form, you will be able to retrieve your quote 365 days a year. This is helpful to know for future price quotes. You can always call us by phone at (336) 355-5679. We’ll work with you and get you a great V8 engine.